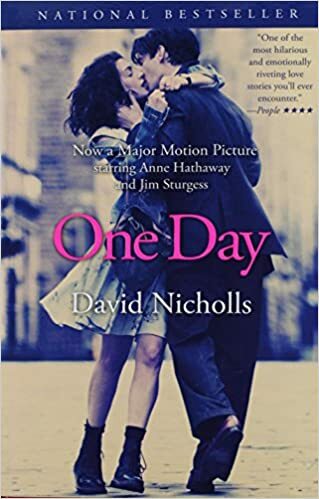 I had issues with the film One Day, which is adapted from this novel by David Nicholls, but I am so in the tank for Anne Hathaway that they hardly mattered. I always meant to go back and read the novel, and thanks to a sale on the Kindle edition I’ve finally done so. The premise, in case you’re not aware, is that the novel follows two friends, Dexter Mayhew and Emma Morley through the course of their lives by focusing on the events of the same day, year after year. Beginning on the day after their college graduation, when they spend a memorable evening without sleeping together, Dexter and Emma remain friends, sometimes intimate, sometimes on the periphery of each other’s lives. They go through many of the normal struggles of people in their 20s and 30s, dead-end jobs, crappy apartments, romantic relationships turning sour, the death of a parent. Emma, the better student of the two, still struggles to find a place in the world. She waits tables and performs community theater while holding on to her goal of becoming a writer. Thanks to a chance encounter Dexter embarks on a meteoric rise to a career in TV presenting, but his drinking and partying threaten to derail him at every turn. Though it seems inevitable that Dexter and Emma will eventually get together, the path there is winding and full of the drama of real life. There are times when the reader will wonder whether the two of them being together is such a great idea, as their fights and disagreements are visceral and real. It is to Nicholls’s credit that his characters are built well enough for the reader to want to follow along with such a large chunk of their lives. If you’ve seen the movie, you know in a general way how the book ends, and it’s a real bummer. I know it made me mad when I saw it, and it’s no less jarring in print. Still, Nicholls’s ability to craft characters and write dialogue earn him a lot of leeway with me, and it’s a testament to his effectiveness that the ending, however much it might feel like a cheat, is still so affecting. Share the post "Days of Their Lives"